Uig forms part of what is recognised as one of the most beautiful landscapes in the Hebrides and is one of the thirteen areas that make up the Hebridean Island of Lewis. This stunning backdrop will provide you with the perfect base from which to explore these historic Islands including, close neighbour Bernera and the landlocked Isle of Harris. 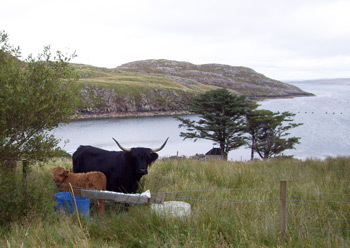 Taigh nan Eilean is situated on a fifteen acre croft in the Village of Uigen, which is part of the community owned Bhaltos Peninsula, it's in the heart of Uig! Added to the spectacular scenery around this stunning self catering cottage is a small 'Fold' of Highland Cattle and Black Face Sheep, who will watch you with the same curiosity you view them. These gentle creatures graze in the fields surrounding the cottage. Taigh nan Eilean offers luxury and comfort with total peace and relaxation as standard. Rated four star by the Scottish Tourist Board this stunning house is also suitable for disabled visitors and has a class one ranking. Should you tire of relaxation adventure is never far away! Sea Safaris, Excursions, Kiting, Kayaking and Surfing are just minutes away, there are also plenty of ideal opportunities for fishing, walking, exploring as well as fine dining. The Heritage Centre, Museum and Tea Shop again are only minutes away, but venture a little further for the islands golf courses, theatre, a variety of museums and art galleries. For millennia "Uig" has been a favourite destination, the famous 'Lewis Chessmen (circa 1101 to 1200 AD )' were found here back in 1831, in a sand bank at the head of the Bay of Uig. Who knows what treasures are still waiting to be found, or what you might discover? Taigh nan Eilean and Uig are an ideal location for those whose ideal holiday combined sea, white sandy beaches and breathtaking scenery in a timeless landscape. Read More on what you can expect on your Hebridean Holiday.